Happy Monday to all of you. I’m off of work today, but not for anything fun… Olivia is having tubes put in her ears bright and early, so we are probably at the hospital as you’re reading this. Our weekend definitely had its ups and downs. I blame the full moon! Friday night started out rocky. We took the kids out for Mexican and Olivia ended up getting a chip stuck in her throat (we think) because she started crying uncontrollably and stopped eating and kept grabbing her throat and saying "hurt." Brian had to take her out to calm her down, and once she came back I let her sit in my lap and eat a cereal bar (hoping to get the chip to go down) and it must have because she was fine for the rest of the meal. Thank goodness Brian and I had tequila. Brian and I spent the rest of the evening catching up on shows and eating cupcakes that I had gotten for his birthday – chocolate chip cookie dough and red velvet. And they were divine. 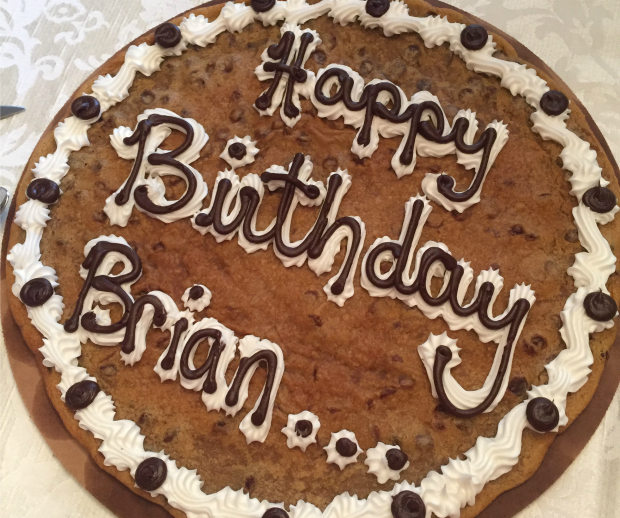 Saturday started out great – we all got up, had breakfast, and then gave Brian his birthday gifts. I finally gave him this gift that I had mentioned back in December and he loved it. (If you want something a little smaller, there is also this one and this one). I also bought him some beer brewed in GA so he already has his first cap to place in our home state. If you have a beer drinking hubs, I highly recommend this. It is hand crafted in the USA, the delivery was quick, and it really is a work of art. Once the birthday gifts were opened, I headed out to pick up Olivia’s birthday shirt and cakes for the weekend. Every year, we have a special shirt made for each of the kids’ birthdays so they have something special to wear for their celebrations. Well, I arrived to pick up the shirt, and they had made it completely wrong. 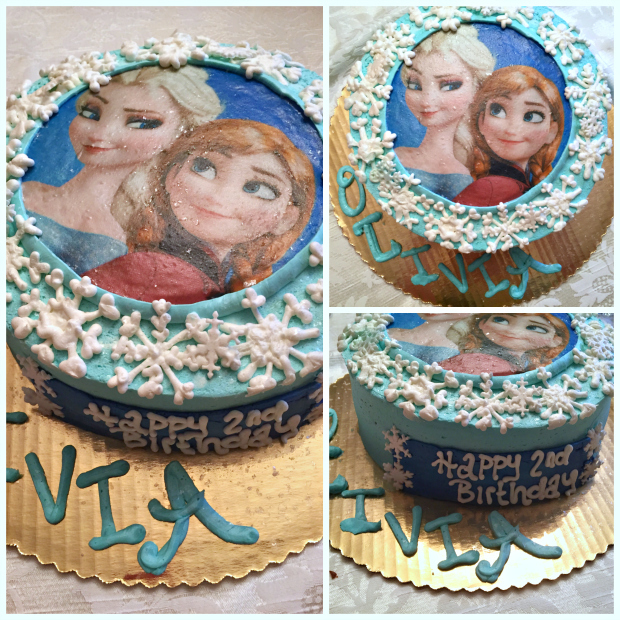 Olivia’s birthday theme this year is Frozen because she loves it (as I’m sure most kids do), and they had put the wrong appliqué on the shirt. You see, Olivia is completely obsessed with Anna (y’all may remember that she was Anna for Halloween) and she couldn’t care less about Elsa. Well, they had used the Elsa appliqué and Anna was nowhere in sight. I told the lady that they had done it wrong, and she told me that unfortunately there was nothing that she could do to fix it until Monday. I told her that we had to have it for Saturday and Sunday and she still told me that there was nothing that she could do. We went round and round for a good 15 minutes and I ended up leaving the place so angry that I was in tears by the time I got to the car. Needless to say, I won’t be using them again, and they have been my go-to for monogramming for years. After that, I headed over to pick up the cakes (which were perfect) and I got even more upset that Olivia wouldn’t have her special shirt to go with those beautiful cakes. By the time I got home, we were running late for a birthday party and Olivia was throwing the mother of all tantrums. We loaded her in the car kicking and screaming and then headed out. I spent the whole car trip trying to find another store who could make a birthday shirt that same day, and after many phone calls, I realized that it just wasn’t going to happen. The birthday party we were attending was for my friend’s son, and it was at Chuck E. Cheese’s, so we spent the next hour and a half listening to screaming kids, blasting music, and the sounds of 1,000 games. I think that my ears were bleeding by the time that we left. Haha. It was so much fun for the kids, though, and they had a blast at one of their favorite places ever! 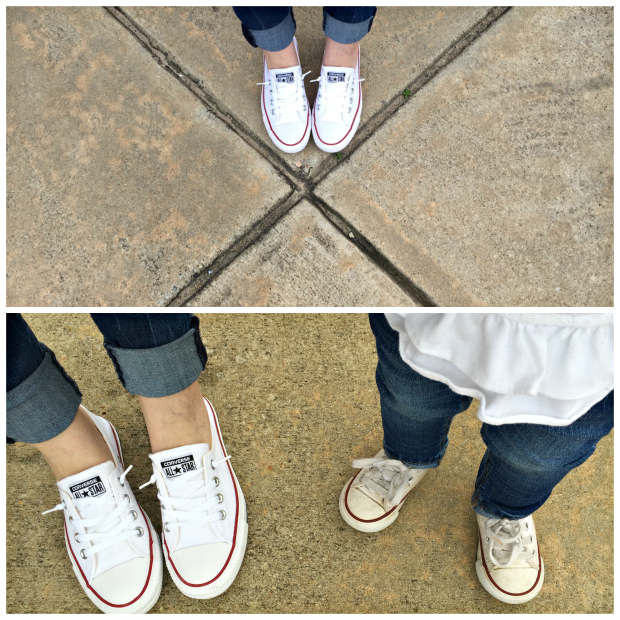 By the time we got home, I was so stressed out that Brian and I put the kids down for a nap and quiet time, and he and I kicked back and enjoyed a couple of cold beers at 2 in the afternoon. Hey, it was his birthday and he deserved it after the morning we had. He is a saint. We spent the evening celebrating Brian and Olivia at Brian’s dad’s house, so we ended the day on a high note. We had pizza and cookie cake, opened presents, and enjoyed visiting with Brian’s sister and her family that were in town for the weekend. Brian and I mixed up some drinks when we got home (you can see my explanation for the Juicy Juice (LOL) on Instagram), and lounged around on the couch. A good ending to a bit of a stressful day. Sunday was great and it totally redeemed the weekend. Since Olivia was birthday shirtless, we let her wear her Anna princess dress from Halloween (which she probably enjoyed even more than she would have enjoyed a birthday shirt anyway) for her celebrations at Brian’s mom and step-dad’s house and my parents’ house. Monday afternoon I’m going to try to run out and have another birthday shirt made so she can wear it on her actual birthday later this week. Lunch was delicious as it always is over there, and then we feasted on cookie cake for Brian and Frozen cake for Olivia. 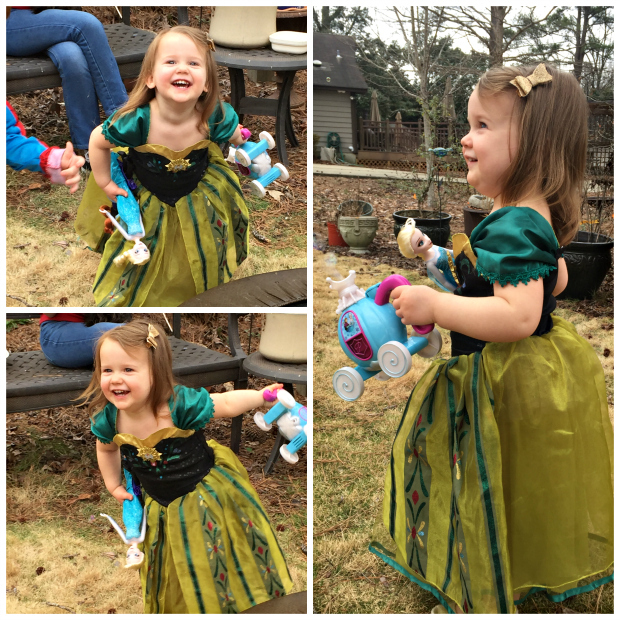 Olivia received so many wonderful gifts, her favorites being an Anna and Elsa doll from Brian’s oldest sister and a Minnie Mouse doll from Brian’s younger sister. After lunch, we spent a lot of time outside because the temp was in the lower seventies (AMEN!) and it was overcast. Olivia carried Anna and Elsa all around the back yard, and we played with the new Frozen bubble blower that she had gotten from Brian’s dad the night before. Hooray for fresh air and bubbles! Dinner at my parents’ house was amazing as well. Brian picked the menu – chicken tetrazzini, broiled veggies, fresh bread, and a bottle of merlot (of course) followed by yet another cake. And this cake was amazing you guys... the pictures don't even do it justice! It was a very fattening weekend and I'll be eating salads for the rest of the week to make up for it! Ha! I hope you all enjoy your day today… please keep Olivia in your prayers. I will let everyone know tomorrow how she’s doing or maybe sooner if you follow me on Instagram! What a weekend! Bummer about her shirt, but she looks pretty happy in her dress! I hope everything goes well today! What a jam packed weekend. I'm so sorry about the shirt! I can't believe they wouldn't do anything to help you out, since they were wrong. Despite the shirt, it sure looks like you had a great end to your weekend! Wow what a weekend! Lots of highs and lows! So glad both hubby and Olivia had a great birthday. Sorry to hear about the shirt. That's ridiculous. Love her dress though at least. So cute! Also those cakes are fabulous!!!! Sending sweet prayers for Olivia today. She will be a rockstar I am sure. Your weekend was definitely full of highs and lows, but it seems like a pretty good weekend. I fear child parties at Chuckie Cheese. Ugh. Shutter. So glad you made it through. Hoping this week is a little better. Can't wait to see Olivia's shirt if you can get one. I would've been livid about the shirt. I'm sorry you weren't able to get another made quickly. But Olivia is just the cutest little Anna (and Jacob is the cutest Spider Man)! Sounds like a pretty great weekend of celebrating! Those cupcakes and cakes - yum!! Hope all goes well today - you guys are in my thoughts!! Wow what a weekend girl!!!! You guys deserved those beers!!! And lots of places where I live start happy hours at 2pm, so there you go. :-) I'm glad Olivia's bday party turned out, even with the shirt disaster... she looks so cute dressed up as Anna! Sorry about the shirt!! Looks like good birthdays and I love her Frozen cake!! Afternoon beer is always acceptable! Especially when it's been a rough parenting day. I can't tell you how many times I reach in the fridge for wine, but we're out. Haha! Those cakes look so yummy. I'm totally going to have to remember to have something funny put on my sister's cake! It's so unexpected and hilarious! I know, right?! Brian and I have started a competition to see who can put the most ridiculous thing on a cake. Haha.